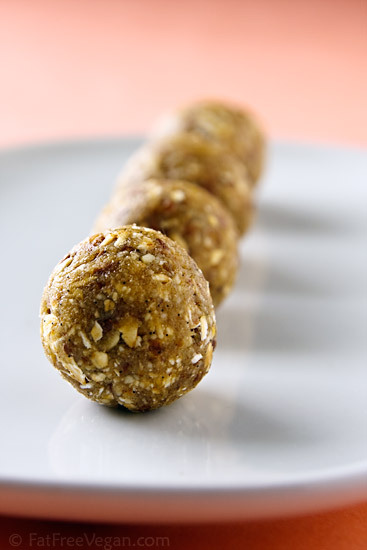 If you like Banana Bread Larabars or sun-dried bananas, you’ll love these banana-cashew balls. 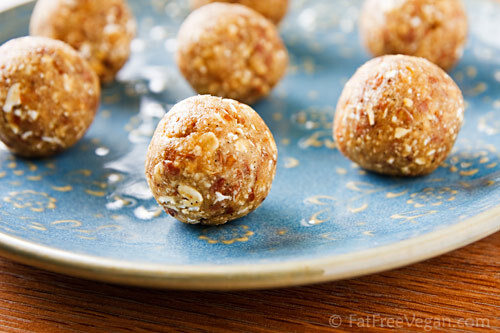 Easy to make, they contain no refined sugar, flour, or oil. Summer’s here, and my daughter is spending large parts of her days swimming instead of sitting in a classroom. E’s on two swim teams, one that practices first thing in the morning and another that practices late in the afternoon. During the middle of the day, she’s constantly in the kitchen trying to replace the calories she’s burning off, and I’m finding it hard to keep enough food in the house to satisfy her. She’s not fond of snack food–she tends to prefer “real” food like pasta, baked potatoes, and samosas–but I like to keep a few healthy treats on-hand that she can grab on her way to or from swimming practice. The key word is healthy, and most packaged snacks just don’t fill the bill. When you’re looking for snacks that don’t have refined sugar, flour, or oil, the only option is to make them yourself. Fortunately, with a food processor and a microwave, it’s easy to make these banana-infused treats. 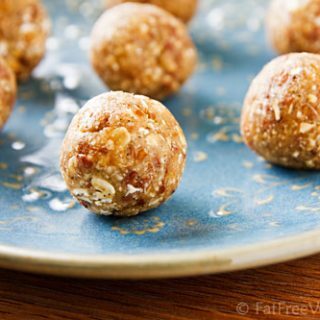 If you like banana Larabars or sun-dried bananas, you’ll love these banana-cashew balls. I start with overripe bananas and “quick-dry” them in the microwave to remove their moisture, preserve them, and concentrate their flavor. You may find that one batch of these is just not enough, so feel free to double the ingredients. But be aware that they are a very concentrated source of fat and calories (no fat-free this time! ), and if you aren’t a skinny 13-year-old who swims twice a day, you may want to eat them in moderation. Note: For information about the safety of microwave cooking, see Bryanna Clark Grogan’s excellent compilation of research. Scrape the banana off the plate while it is still hot (makes cleanup easier) and allow to cool. 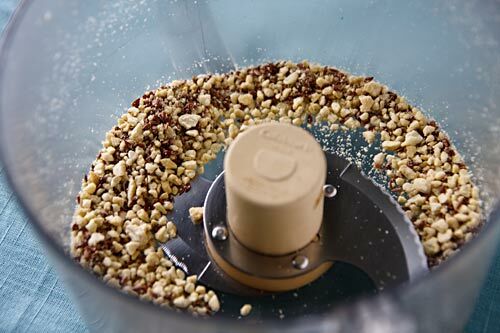 Pulse the cashews in the food processor until coarsely ground. Add the flax seed and oatmeal and pulse a few more times. Add the banana and dates, and scrape the seeds from the vanilla bean into the processor. Blend into a thick paste. Moisten your hands. Scoop up the paste by heaping teaspoons and form into 10 small balls. Place each one on a plate, not touching. Cover and keep refrigerated. *Be sure to use certified gluten-free oats if gluten is a concern. I made this on the weekend. I didn’t have cashews so I used walnuts and it was really, really good. By making this, I found out I really love dates on their own! They are very yummy, but so sweet. Made these today, then made them with almonds for my Dad, because he likes those better. I’ll be re-re-making them over the weekend with dried blueberries because he likes them better than anything! (again with the almonds, but just now thinking I might do blueberry/banana/almond…I’d been planning to sub the blueberries for the bananas and keep the dates, but – well, I’ll just have to ponder that!). Thanks for a super idea for a variant on “the date/nut bar” recipe! So sweet! I added the whole vanilla bean (it was smallish, though) and I don’t regret it a bit. The combination of flavors was fantastic. P.S. : Michelle, I froze them and they were perfectly fine. This is one of the rare occasions where I wish I didn’t ditch our microwave! I’m sure, as you mentioned in comments above, there’s an oven alternative. I can’t wait to give something a try, anyway as these look super yummy. I am SO glad I found your blog. I am eagerly awaiting these in the fridge right now & my kids are very excited! (say “HI” to E for me! ), and I have been vegan since I was eleven. I am also gluten-free and am now low-fat. I follow the diet set by Dr. Neal Barnard (pcrm.org), which he states is optimal for teenagers. I have a blog and I hope you check it out! I love to cook and create recipes, especially baked goods. I alternatively sweetened by baked goods and use no added oil. I feel SO MUCH BETTER eating this way, and I really appreciate your blog, recipes, and thoughts. I tried this recipe yesterday. I substituted cashews with almonds. It came out great. Thanks for this healthy recipe. I’ve been making these with prunes instead of dates and my 13 mo old LOVES them, and I don’t feel guilty about letting him indulge. He will eat an entire batch if I let him! Thanks so much for the healthy snack option!! Thank you for a wonderful website – sensible nutritional advice, and really delicious recipes! As someone who has been vegan for some years, and who also loves cooking (and eating! ), this is a great resource for new and inspiring ideas. I made the eggplant Parmesan last night and it was delicious! Fantastic recipe, especially for kids. My picky toddler loves them, and I just love the microwaving bananas trick! I was also wondering if you could recommend a software for calculating nutritional information? I’d love to whiz my favorite recipes through one, and always prefer getting a reference before purchasing something. Sorry to bother with the request, and thank you once again for a superb recipe. I’m so glad they were a hit with your toddler! For calculating nutrition, I use the Living Cookbook software at http://livingcookbook.com/. Check their website for a free 30-day trial. Wonderful recipe. My kids love them. Thanks for sharing. Tried these last week and they were perfect to take along for hiking. Thanks, Susan! Hope to see you again at BlogHer this year. Thanks so much for this recipe! I was looking for gluten & dairy free and raw-vegan options and this one fits the bill if I dehydrate instead of microwave. Thanks for all the posters who posted their variations because that really helps me adjust, too. Loving it. I have recently become a vegan and completely stopped artificial process food as well. It is a challenge and I find Banana Cashew balls is a good option for me. These were great! The only problem is stopping with just one or two. Thanks, Susan. I’ll be trying the cherry ones next. I just had my husband make these and there were amazing. Our microwave is more powerful than most and dried the bananas a bit too much even with less time so we used four dates to compensate. I love how you can taste each ingredient in this and they are all yummy. I don’t know how anyone could eat just a serving of these, we ate the whole batch! I have made these twice now and have not been able to make them very sticky either time. I slightly burned the bananas this time around, and last time I am not sure they cooked enough. Also, last time I used a blender, and this time a food processor. I even added an extra date this time, and still they were just crumbling. What is the secret? They are still quite delicious, but I imagine if they were stickier, would be far tastier. [This time I also rolled half the batch in cocoa powder, just for fun.] Any suggestions to make them smoother and stickier? Perhaps you process them for a long time? Make sure you’re using RAW cashews, you can’t use roasted or it won’t be the right consistency and be too crumbly. Using a super high power blender makes all the difference too! Hope that helps! Another thing to consider is the moistness of the dates. Dates grow drier the longer they sit, so try to find the freshest ones you can. They’re much stickier when they are new and plump. I made these using frozen bananas instead of dehydrated ones. I also added a little cinnamon because I don’t have any vanilla beans right now and if you use vanilla extract in a raw recipe you can taste the alcohol. (yuck) After processing I quickly made balls with a small cookie scoop and popped them into the freezer to firm back up. Ice cream balls! Interesting recipe, I intend to try it sometime. I do not use a microwave so do you think I can dry the banana in oven or stovetop? I never thought one could have oatmeal/oats uncooked, good to know. You could probably dehydrate the banana in a very low oven. Leave the door cracked open and cook for several hours until the banana slices have reached the right consistency. 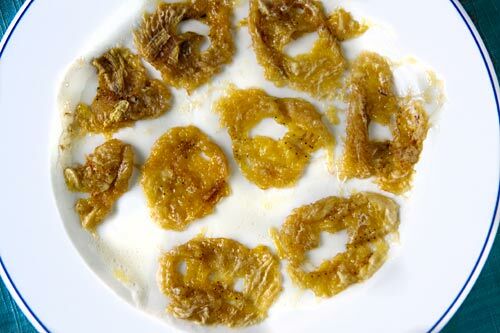 Is there another way to dry the bananas for this recipe because I’m not too fond of microwaves and I also donot have a dehydrater but if I can’t find another way I guess I’ll utilize the microway to dry out the banana. The recipes looks amazing so I will most definitely try it. You could try setting your oven on a very low temp and dehydrating them that way. I would do a Google search to find out the correct time and temp for dehydrating bananas in the oven. Quick question: Did you grind the flax before putting into the food processor? It looks like whole seeds in there but I can’t really tell. Also, do you think chia seeds would work as a replacement? Yes, I had already ground the flax seeds before I used them. I think chia seeds would work too, and you probably won’t need to grind them (but it wouldn’t hurt). Any reason they need to stay refrigerated? I’m looking for some healthy snacks to throw into a bag when mountain bike riding. Just wanted to say thanks for the idea because we made these today and loved them. This is a great site and I am really glad I found it. I am living in Tasmania, and on the 5:2 diet. Your under 200 cal recipes are just perfect for this diet. Today vegan friends visited and I made your eggplant and chickpea curry-really nice. Thanks so much. These sound yummy and easy to make. However, are the bananas necessary? I note a lot of vegan/vegetarian recipes use bananas as a sweetener, but I’m allergic to them so miss out on lots of treats ‘cos I can’t think of a substitute. Any ideas? (And I’m highly allergic to avocados, too, another vegan favourite.) Thanks! ingredients except for the vanilla bean. Thanks for your feed back. Yes, just add it drop by drop to taste.